Marvel was all into wrestling and suicide stories in the 1980s. Armadillo is now a pro wrestler, but when he finds out his wife is cheating on him he goes ballistic, beats up some cops (dude, what did they do?) and then tries to kill himself by jumping off a building. But his armor saves him. 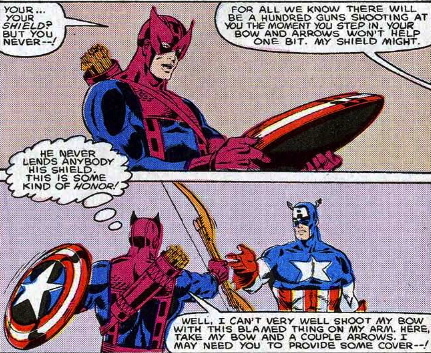 Hawkeye and Mockingbird help out with this, and in the next story Cap helps them fight a team of guys who all throw things (balls, knives, discs, etc.) called The Death Throws. Wawk and Cap switch weapons for the fight, for reasons that make no sense at all. These are just a couple of bad issues.